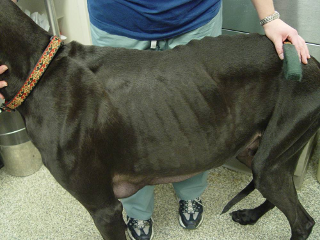 Dog with muscle loss (cachexia) over the back, over the shoulders, and on the hindquarters. Weight loss in adult animals or failure to grow adequately in growing animals can be indications that heart disease is present in a pet. Puppies and kittens that fail to thrive—especially when compared to their littermates—should have a careful examination of their hearts performed to ensure no congenital heart disease is present. However, many young animals that are born with heart disease will grow normally so other signs should be looked for, especially in certain breeds most likely to have a heart condition. In adults, heart failure is commonly associated with weight loss, particularly muscle loss, which may be seen at its most early stages mostly in the muscles over the top of the back, over the shoulders, on the hindquarters, or on the top of the head. This muscle loss (cardiac cachexia) is caused by hormone-like substances that are produced by the body in high levels in congestive heart failure. Appropriate treatment of heart failure, adjustment of drug therapy, dietary changes and certain supplements may be able to minimize weight loss.